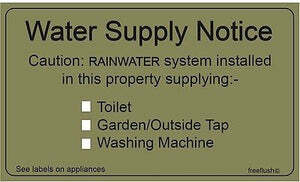 Rainwater Harvesting Adhesive Labels Sticker Pack – Freeflush Rainwater Harvesting Ltd.
Rainwater Harvesting Warning Label Pack as stipulated in BS8515. . 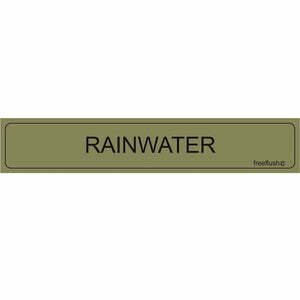 These labels help clearly identify rainwater supplies in the home and garden and are typically required for your rainwater harvesting installation in accordance with the requirements of BS8515.. The labels are printed on heavy duty vinyl and are suitable for outdoor use. 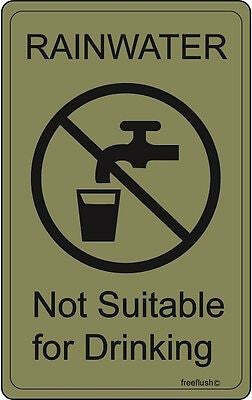 1 x Not Suitable for Drinking Warning Label - to identify at any tap or appliance that the water supply is from your rainwater harvesting system and not mains water supply. Apply to the side of all appliances where rainwater is used. 6 x Rainwater Pipe Identification labels for application to all visible and buried pipework where clear identification is required. 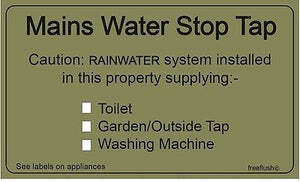 We offer mixed labeling kits for rainwater harvesting systems. Please contact us if you require a different mix pack. All labels are 102mm wide, varying height.